A quarter of adolescents engage in some form of self-harm and even experienced therapists can find working with these young people difficult. Based on Cognitive Behaviour Therapy (CBT), a highly effective method for working with emotional problems, Cutting Down offers a practical and accessible programme for mental health therapists from different professional backgrounds working with young people who self-harm. The programme is comprised of four parts, each covering a specific stage of therapy, and is split into 27 short　modules. Although designed to be delivered over a course of 14 sessions, the programme is presented in a way that allows the therapist to decide which combination of specific modules is chosen and how long is spent on each, based on the specific clinical needs of the person they are working with. Throughout the programme, virtual patients are used to illustrate the various exercises and strategies. Part One, What’s Going On?, introduces self-harm and CBT and aims to develop insight into feelings, problems, goals and the concept of change. Part Two, Feelings, Thoughts and Behaviour, looks at working on activities, managing depression and identifying and managing negative thoughts. Part Three, Coping Strategies, introduces modules on problem solving, assertiveness, mindfulness and alternatives to self-harm. Part Four, On You Go!, finishes up the programme with a review of goals, identifying triggers and developing a ‘first aid kit’ and a ‘tool box’ of skills to reinforce the programme. Downloadable worksheets enhance the practicality of the text. 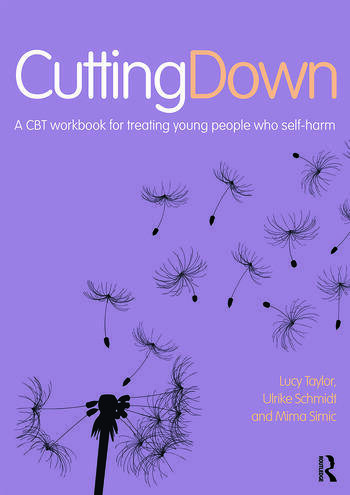 Designed to support clinicians working with adolescents engaging in self-harm, this unique workbook is ideal for counsellors, counselling psychologists, clinical psychologists, CBT therapists, IAPT practitioners, CAMHS mental health workers and nurse therapists as well as students and trainees. Part I: What’s Going On? What is Self-Harm?, The Function of Self-Harm, Problems and Goals, What is CBT?, Getting to Know Your Feelings, Relationships and Strengths, Are You Ready to Make Some Changes? Part II: Feelings, Thoughts and Behaviour. Feelings diary review and activity scheduling. The Help Triangle. Negative Automatic Thoughts (NATs). Thought Distortions and Thoughts Challenging. Beyond the Help Triangle: Core Beliefs and Rules for Living. Formulation – ‘My Journey’. Part III: Coping Strategies. The Coping Tree. Problem Solving. Assertiveness. Basic Anger Management. Taking Care of Yourself. Facing the Situation. Riding the Wave. Being Mindful. Self-Soothing. Alternatives to Self-Harm. Part IV: On You Go! Reviewing Your Goals. Identifying Triggers. First Aid Kit and Tool Box. My Path and Certificate. Lucy Taylor is a consultant clinical psychologist at the National & Specialist Child and Adolescent Dialectical Behaviour Therapy (DBT) Service, Michael Rutter Centre for Children and Young People, South London and Maudsley, NHS Foundation Trust. She is BABCP accredited and has a private practice based in Surrey. Mima Simic is Joint Head of the Child and Adolescent Eating Disorder Service and a consultant child and adolescent psychiatrist for the Child and Adolescent Dialectical Behaviour Therapy Service at the Michael Rutter Centre for Children and Young People, South London and Maudsley, NHS Foundation Trust. Ulrike Schmidt is Professor of Eating Disorders at the Institute of Psychiatry, Kings College London and Honorary Consultant Psychiatrist in the Eating Disorders Unit, South London and Maudsley NHS Foundation Trust.